As the countdown to the 2012 Olympics kicks off with an unlikely theme song, I look London Calling and its zombies and heroin for the BBC. Sadly there was no space to mention Clash fan of Indian origin Harraj Mann, questioned in 2006 under the Terrorism Act after a taxi driver taking him to Heathrow airport became alarmed that he was listening to London Calling and called the police. The incident was seen as a massive overreaction, suggesting either that the song has lost its incendiary power, or that the authorities were being over-cautious – or both. 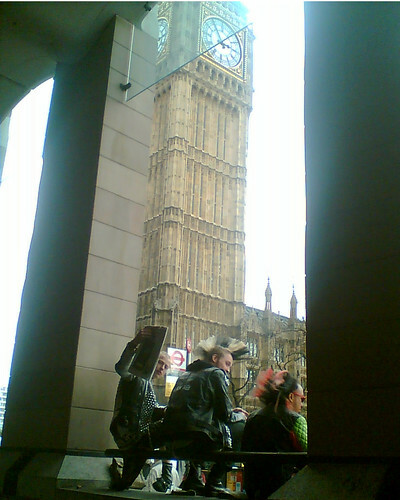 Image of comedy London punks in Westminster, 2006. It turned out, as they snarled at me, that I’d broken some implied contract where I’d pay to photograph them in a public place. Some overlap with an earlier piece I wrote about (White Man) In Hammersmith Palais. People who like to know about mixing an instrument DI with a Neumann U87 on the cabinet will appreciate Mix’s Classic Tracks feature on the song; this BBC audio slideshow on the London Calling album is less abstruse.